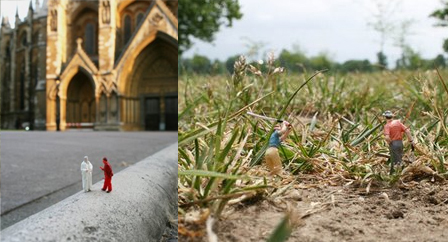 Slinkachu is at it again, adding his innovative flair to the world of creative urban street art. 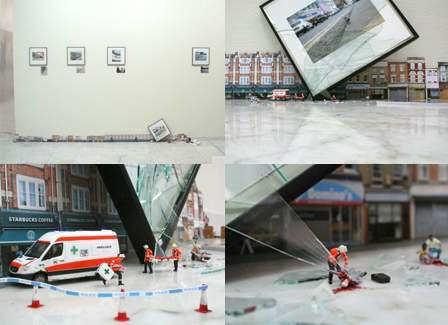 These photographs, taken around town in London and even shown in galleries, are just a small portion of his “little people” collection. Other works are available for purchase and have been featured in books and periodicals. Though some of his work has been displayed at art shows, much of it slips quietly into urban landscapes. The juxtaposition of closeup photographs and faraway images shows just how small these little street art people truly are against the backdrop of a larger city. Some installations play off their backdrops and explore larger themes, like the Little Gods to the left. Others are simply offbeat and humorous, such as From The Rough to right, showing small golfers making a go of swinging in a veritable forest of grass. One has to wonder: do people passing by notice these installations, and does it cause them to consider issues beyond the simple and beautiful ingenuity? The above display of urban camping might conjure images of potentially creative homeless shelters and other forms of nomadic urban dwelling. Still, whether these are merely clever or deeply thought-provoking is, of course, a subjective judgment.